Yamagata Film Critic Workshop Day2 : The Pearl Button – ドキュ山LIVE! Chilean filmmaker Patricio Guzmán’s critically acclaimed documentary, Nostalgia for the Light, wove together poignant meditations on astronomy, political repression and lost potential using the geography of the Atacama Desert, reputed to be the most arid region on earth. 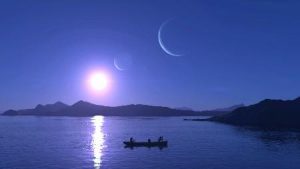 Guzmán returns to these lofty subjects in The Pearl Button, an equally profound scrutinization of Chile’s colonial brutality towards its people alongside humanity’s relationship to the universe, this time employing the element of water. Early in the film, Guzmán laments that despite having one of the longest coastlines on earth, contemporary Chile lost a significant part of its identity by failing to acknowledge its oceans. Using the archipelagic waters of Patagonia as an entry channel, Guzmán artfully plumbs the depths of Chile’s dark secrets, his poetical ruminations flowing effortlessly from the cosmic (such as the dazzling galaxies observed by colossal radio satellites in Atacama) to the man-made (ancient wooden canoes and spine-chilling relics of mass genocide). Guzmán’s proposal that water contains the history of humanity might appear tenuous, but eventually, all the seemingly disparate subjects of the film are meaningfully bridged together through a button discovered at the bottom of the ocean. His deeply nostalgic – but never romanticised – recollections of Patagonia’s native water nomads and their genocide at the hands of cruel foreign settlers and missionaries are juxtaposed with a sobering re-enactment of the barbaric tragedies that occurred under the Pinochet rule, when political prisoners of the 1970s were slaughtered by the thousand and dumped into the sea. Later, when we learn of Jemmy Button, the first native to be brought to ‘civilisation’ (and the inspiration for the film’s title) for the price of a pearl button, Guzmán confronts us with the knowledge that the native underwent a traumatic historical experience, “travelling from the Stone Age to the Industrial Revolution” in a heartbeat. Epiphanic moments abound, both philosophical and visual. Guzmán’s humanist, deeply provocative narration is complemented by cinematographer Katell Djian’s high-res imagery. In one second we transition from micro to macro: from a universe of pollen and dust swirling within a single drop of water to staggering footage of glittering space nebulae that fill the universe above us. Throughout the film, conventional beauty is interspersed with more jarring elements. When a vocal musician “sings” the music of water, his glottal drone is otherworldly, just as uncanny and ancient-sounding as the nearly extinct language of Kawésqar, spoken in the film at Guzmán’s request by the handful of surviving descendants. Martin Gusinde’s black-and-white portraits of masked natives, their naked bodies adorned with intricate patterns and lines, melt supernaturally into glorious vistas of the cosmos, a transition which shows that for all our technological advancement, modern humanity has no more understanding of the universe than what the ancient Kawésqars could intuit.